China's largest Twitter-like service Weibo has unveiled plans to sell shares on the US stock market. 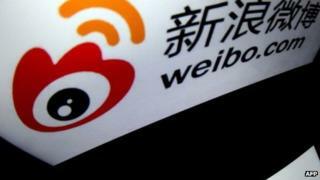 Weibo, owned by Chinese internet giant Sina, is looking to raise $500m (£300m) via the share sale. However, the firm did not give details of the number of shares it plans to sell or the price range. According to papers filed with the US regulators, it had 129.1 million monthly active users in December and generated revenues of $188m in 2013. "A microcosm of Chinese society, Weibo has attracted a wide range of users, including ordinary people, celebrities and other public figures, as well as organisations such as media outlets, businesses, government agencies and charities," the firm said in its filing. China's internet market has grown to become the world's biggest with more than 500 million users. With major global social networking firms such as Facebook and Twitter blocked in the country, domestic companies have benefitted the most from this growth. The popularity of services such as Weibo has also been driven in part by the fact that they gave users a platform to share unfiltered information. As more people have got on the social media bandwagon, revenues at firms operating these services have also risen. Weibo said its revenues nearly tripled in 2013 from a year earlier, as more companies advertised on the platform in an attempt to attract perspective customers. The firm said it expects the trend to continue. "We expect our advertising and marketing revenues to increase in the foreseeable future as we continue to introduce new advertising and marketing solutions and attract more customers," it said. However, the growing popularity of social media platforms has also attracted the attention of authorities who have moved swiftly to silence voices online. A law has been introduced to allow the Chinese government to jail microbloggers and dozens were arrested last year. That has seen many users ditch the platforms in favour of mobile messaging services. A report published last month indicated that the number of Weibo users declined steeply in 2013. The China Internet Network Information Center said in its annual report that almost 28 million people abandoned Weibo last year. The fall marked the site's first drop in usage amid a government crackdown on so-called 'rumour mongers' online. That has triggered some concerns over whether firms such as Weibo will be able to sustain the rapid pace of growth seen in recent years. The firm itself has highlighted the area as a potential risk. "If people do not perceive content and other products and services on our platform to be interesting and useful, we may not be able to attract users or increase the frequency of their engagement," it said. "A number of user-oriented websites that achieved early popularity have since seen their user bases or levels of engagement decline, in some cases precipitously." Who are China's weibo super stars?